Complete delivery and set up! 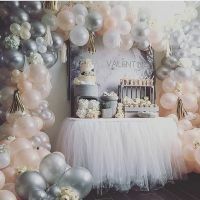 There’s a reason why balloons are one of the most universally popular party decorations at any event from a casual birthday to a formal gala: It’s because balloons are a most budget friendly way to add a splash of festive color to any room. From things like giant character balloons to fun shapes and bouquets. There are tons of options to fit whatever theme you’ve selected. If you think that balloons are just for birthdays, you will certainly think again after you see some of our awesome creations for weddings. From fun backdrops for the wedding ceremony and lining the aisles as you walk to say your “I Do’s” to hanging balloons from the reception space ceiling. This is just a few ideas when it comes to all of the unique and creative ways you can incorporate balloons into your day. Some are customized with words or sayings, some are filled with confetti and we just love the giant oversized ones. Get ready to be inspired for your event!